In lieu of the ability to post genealogical research to Wikipedia.com, postings for genealogical research are located here. 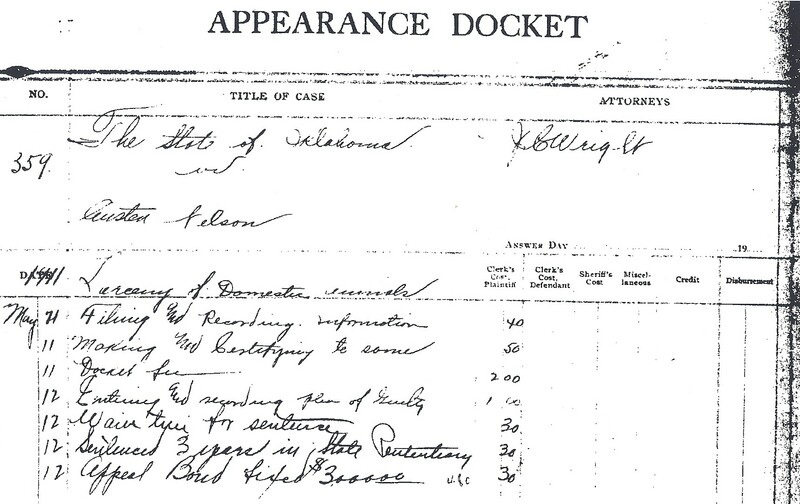 The genealogical research is in regard to the federal population record of Laura Nelson and her family. Unfortunately, according to Wikipedia administrator 'SlimVirgin' the records are not 'primary', but 'speculative'. However, it is easy to see the relationship between the records and how they substantiate Laura and her family's life leading up to her and her son's death and her husband's incarceration. Austin, Laura and their son L.D. Nelson were taken into custody after L.D. 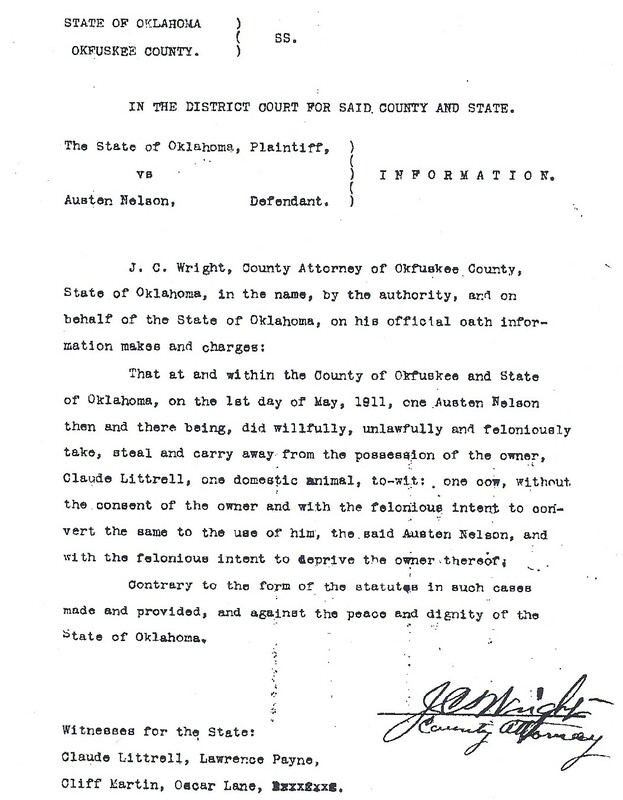 Nelson allegedly shot and killed George H. Loney, Okemah's deputy sheriff, when Loney and a posse turned up at the Nelson's home to investigate the theft of a cow belonging to a Mr. Claude Littrell. Laura's husband pleaded guilty to the theft and was sent to the state prison at McAlester in the town of the same name for three years. Some accounts say in an effort to save her son, Laura said she had fired the fatal shot. Both she and L.D. 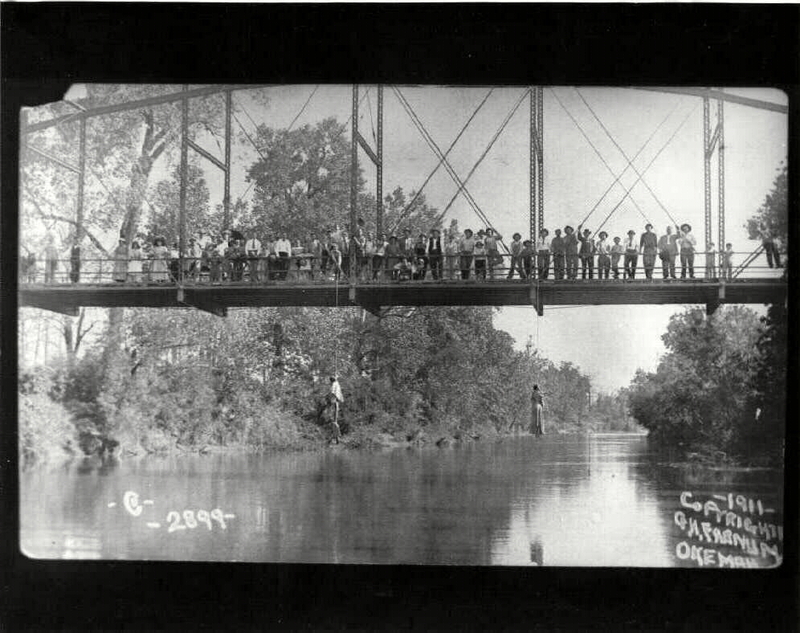 were arrested and placed in jail at Okemah before their position there was compromised at the Old Schoolton Bridge by lynching. 25 MAY 1911 (Thursday) - Laura & L.D. 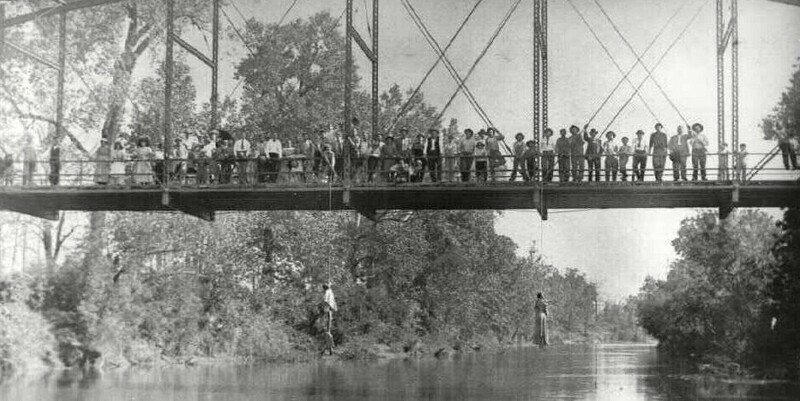 Nelson lynched from the Old Schoolton Bridge @ Yarbrough's Crossing, west of Okemah, OK. 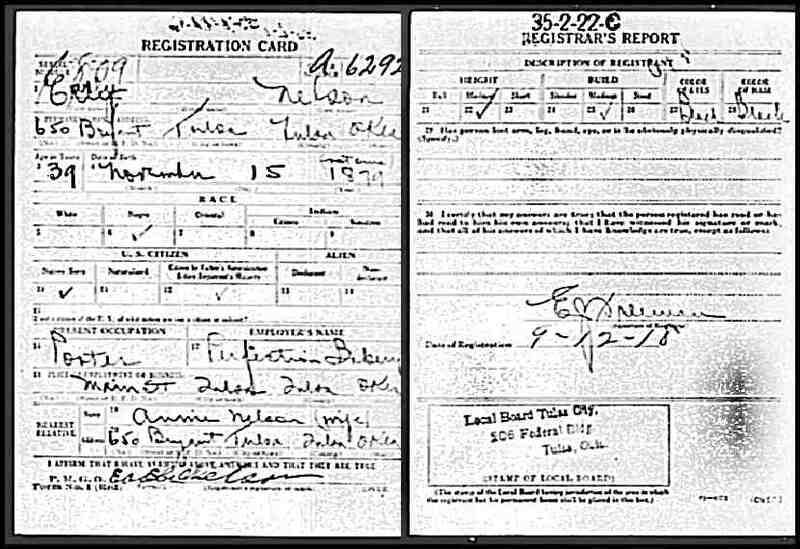 If the date is not linked above, it has yet to be officially found in documented records. 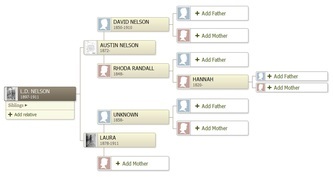 While Laura's genealogy is not obvious, her husband, Austin Nelson, can be traced to his father, David Nelson, who is described on the 1870 US Federal Census of Meridian, Bosque County, Texas. 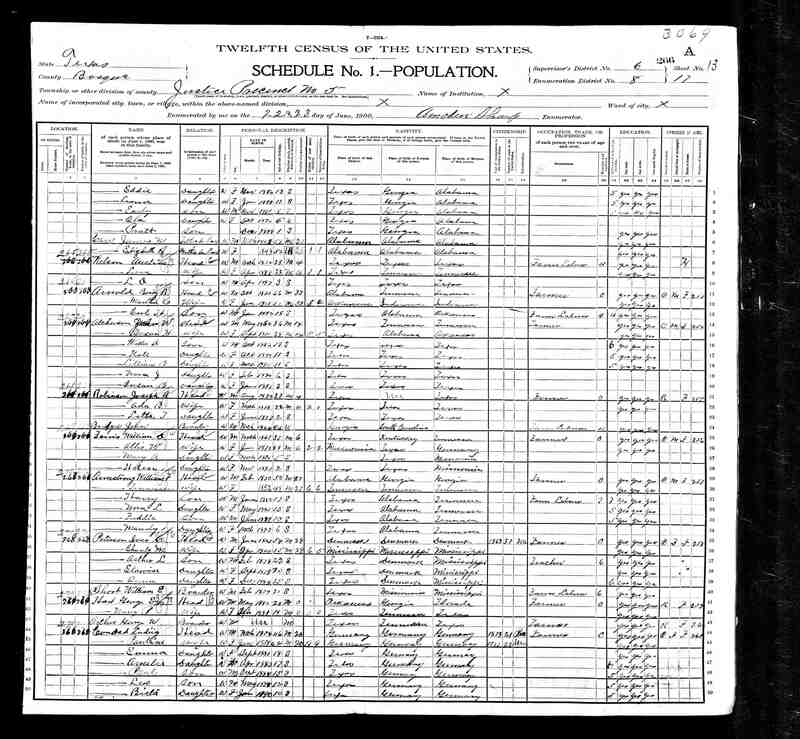 David Nelson (c. Apr 1850 in Georgia) is living with his wife, Rhoda (Randall) Nelson (c. 1848 in Alabama or Louisiana), whom he married on September 16, 1869 in Texas--taken from the Texas marriage index on www.ancestry.com. The couple reside with Rhoda's alleged--but not confirmed--mother named Hannah Randall (c. 1820 in Georgia). The couple have two children named Delona Nelson (c. 1869 in Texas) and Mary Ella or Marietta Nelson (c. February 1870 in Texas). Of significance is that the Nelson surname in the 1870 census is written to reflect 'Wilson'. 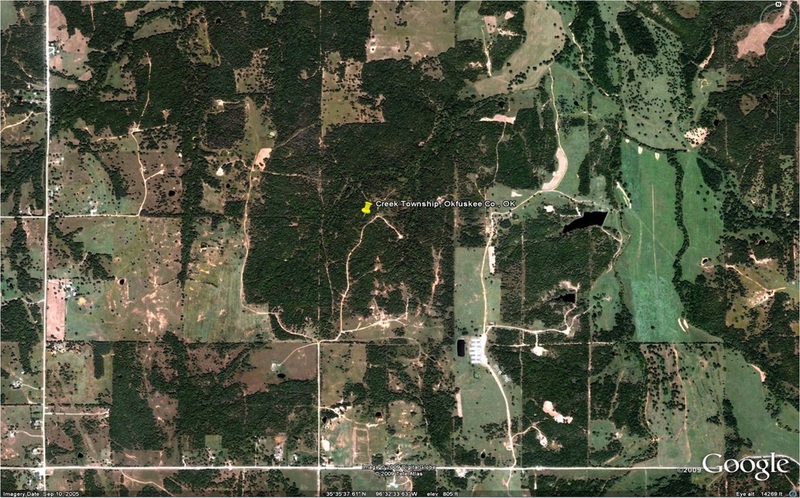 By 1880, the David Nelson family has moved to District 104 of Waco, McLennan County, Texas. 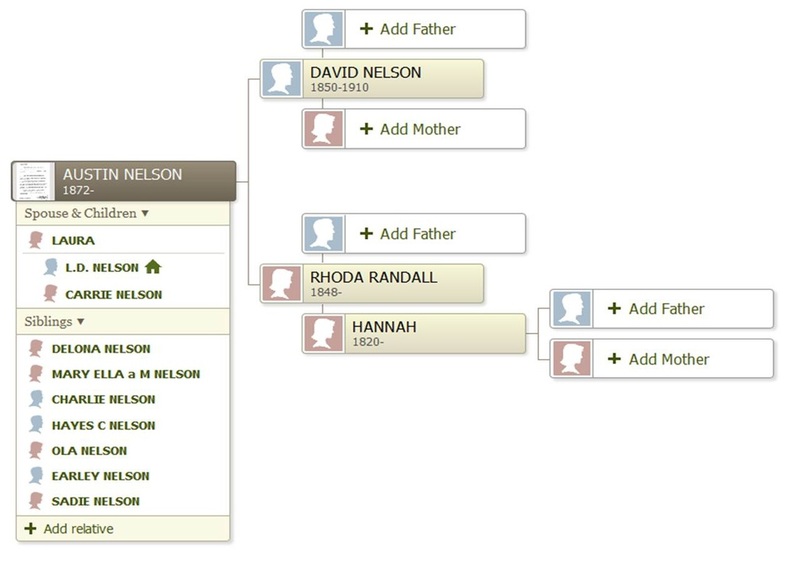 Their family has also grown considerably with the addition of Austin Nelson (c. March 1872 in Texas), Charlie Nelson (c. 1874 in Texas), Hayes Columbus Nelson (24 December 1877 in Texas), and Ola Nelson (c. 1878 in Texas). Both Delona and Mary Ella Nelson are still present in the household, but only Delona Nelson is listed as attending school. 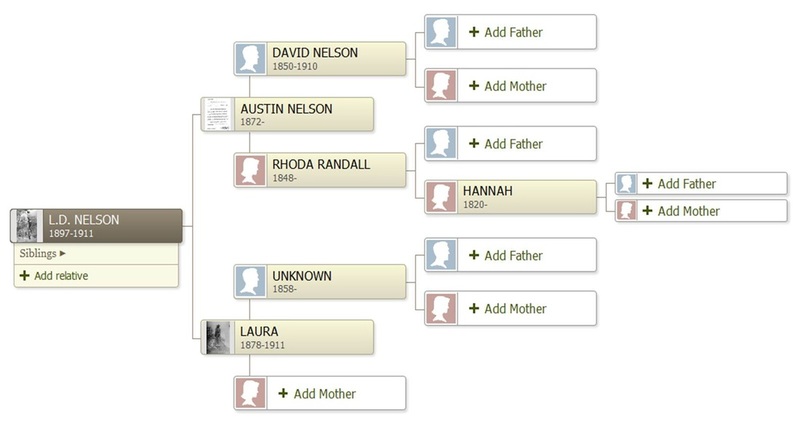 David and Rhoda Nelson would go on to have an additional two children: Earley (15 November 1882 in Texas) and Sadie Nelson (c. May 1884 in Texas). 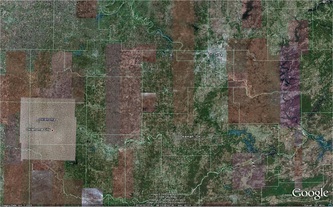 David Nelson and his family would move on to Eason, Pattowatomie County, Oklahoma by June 16, 1900. Austin Nelson married his wife Laura sometime between 1896 and 1898 in Texas. 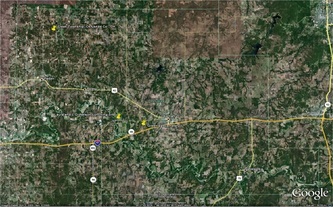 By 1900, Austin and Laura lived in Pct. 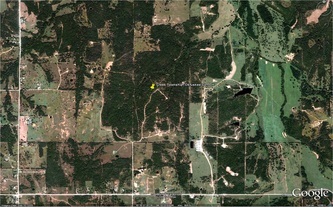 #5, District 8 of Bosque County, Texas. This is the same census in which the Nelsons describe being married for four years, again issuing a date of about 1898, and where their Texas-born son L.D. Nelson makes his first appearance as a three-year-old boy. The family is also listed incorrectly as being Caucasian. Austin describes himself as a farm laborer during this time. Laura and he are also listed as literates; able to read and write. 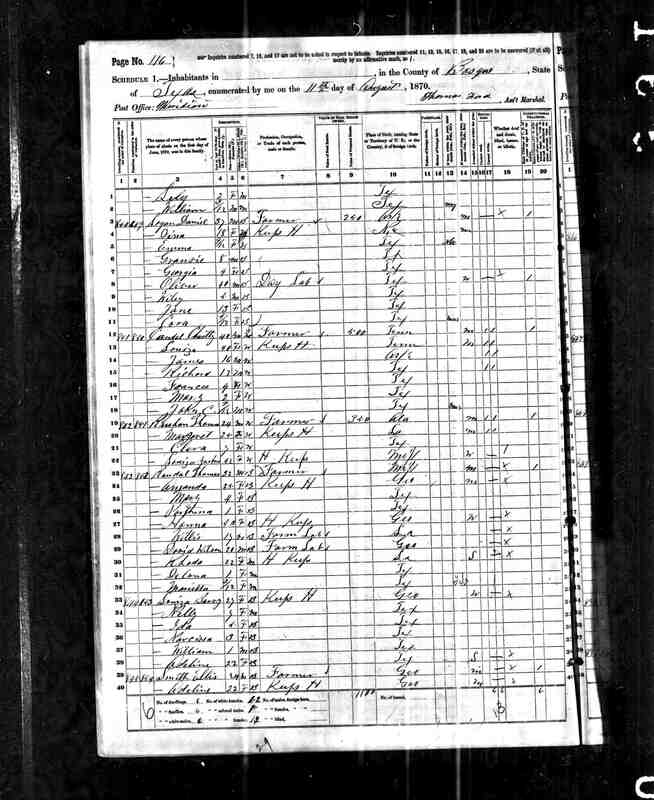 April 28, 1910 is when the Nelsons are enumerated again, but this time as part of the 1910 US Federal Census of District 138, Creek Township, Okfuskee County, Oklahoma. 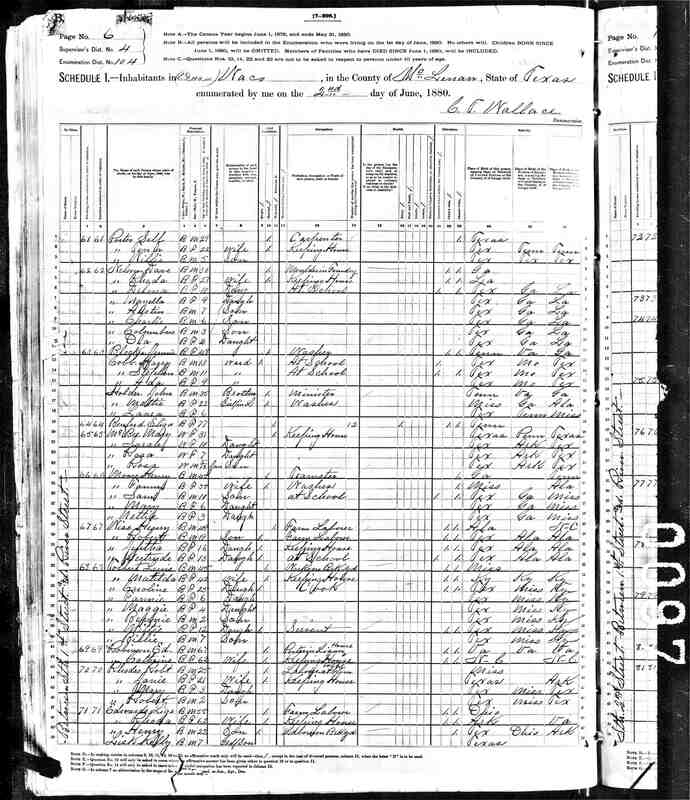 This census captures Austin Nelson at a reported age of 35, Laura Nelson at a reported age of 27, L.D. 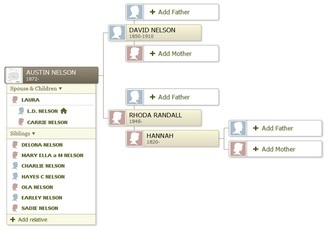 Nelson at a reported age of 12, and the Nelson's daughter named Carrie as a one year old. Carrie Nelson is listed to have been born in Oklahoma. Laura describes herself as having had a total of three children, but only L.D. and Carrie are living. Austin describes himself as a Farmer. 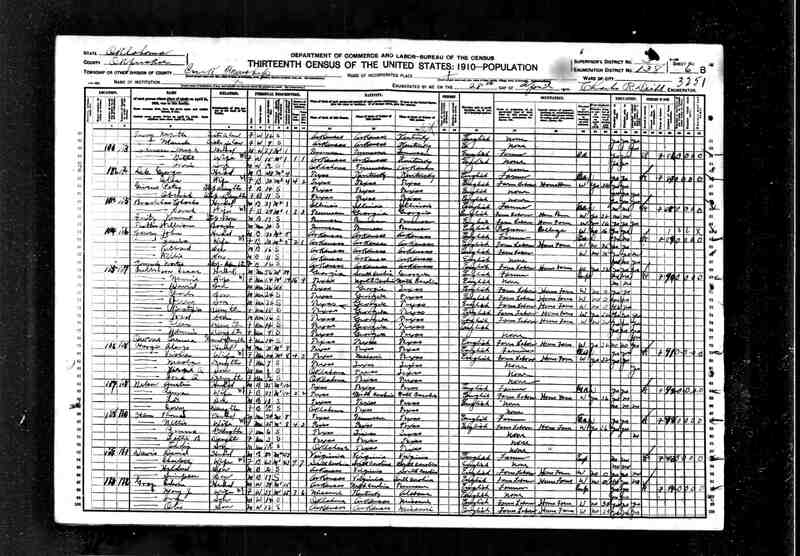 The 1910 census was conducted by Mr. Charles R. Deibl exactly one year and 25 days before the Nelson family was compromised. 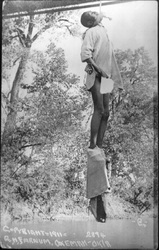 The bodies of Laura and L.D. 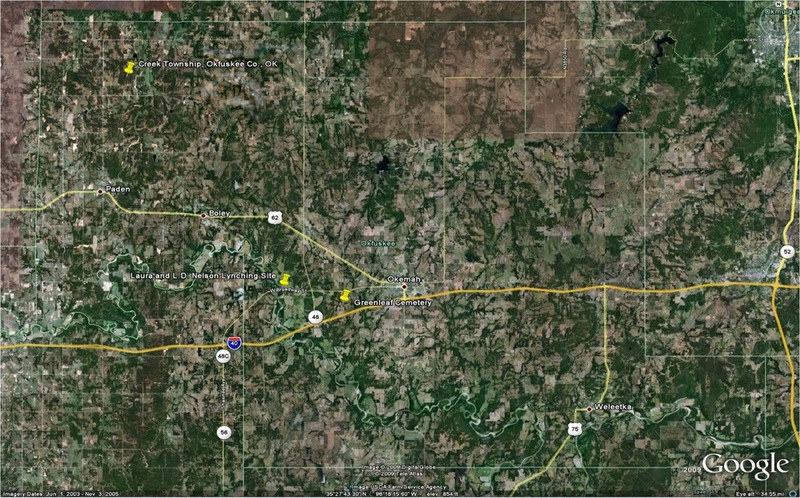 Nelson were interred at Greenleaf Cemetery south of Okemah, as the Nelson family made no effort to claim them. The graves are not marked. As yet, there is no concrete proof that L.D. wore the name 'Lawrence', much as the case with some reports alleging Laura's name was 'Mary'. And that misinformation should not be perpetuated, though this is the case on the Wikipedia.com website concerning the Nelson lynchings. Austin's brother, Hayes Columbus Nelson married a woman by the name of Janie in about 1900. She had a son, named Roy Mitchell from a prior marriage. 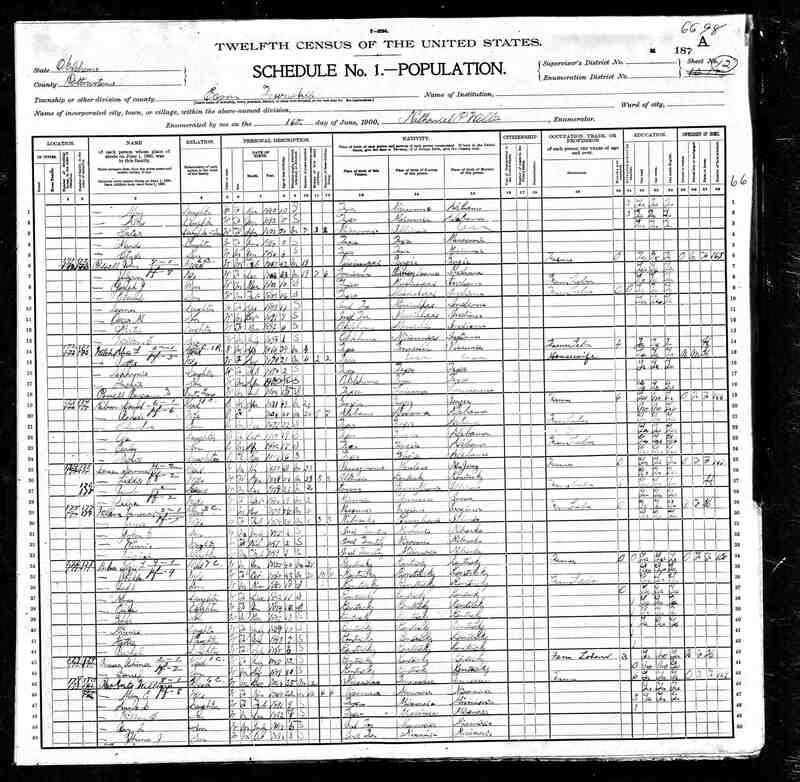 Together, Janie and Columbus had a daughter named Rosie Nelson in about 1902 in Oklahoma, but have a total of three children living in the 1910 census year. 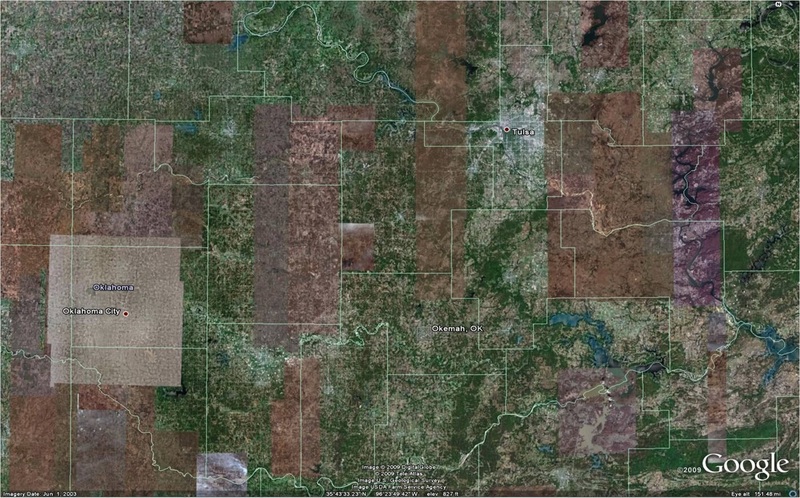 Columbus drafted for World War I on September 12, 1918 out of Boley, Okfuskee County, Oklahoma. 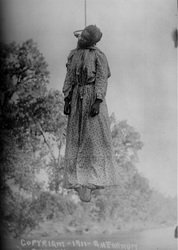 Austin's brother, Earley Nelson married a woman by the name of Anna in about 1908. Together, Earley and Anna had a daughter named Fannie Nelson earlier in 1910 in Oklahoma. 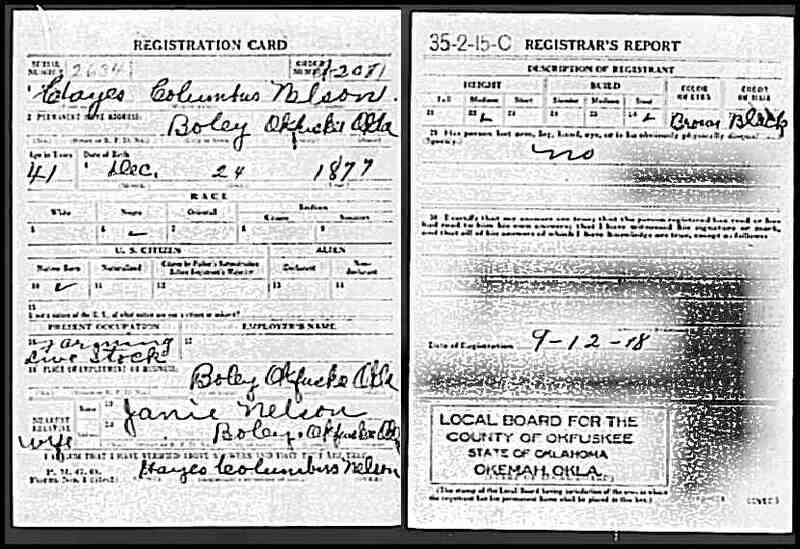 Earley drafted for World War I on September 12, 1918 out of Tulsa, Tulsa County, Oklahoma. The Nelson family tree was compiled by Andrew Hardaway. This information was discerned from available US Federal Census Records, but may not be perceived as primary records.